When a patient comes to Complete Cosmetic Care Dentistry in Glenpool, OK, dealing with tooth loss—whether that is one missing tooth or several—Drs. Mohanna and Georgy are completely non-judgmental and only want to help restore your smile and your oral health. With this in mind, we provide tooth replacement with dental implants, and we do the entire procedure in the convenience of our office. Dr. Mohanna has extensive training in the art and science of implant dentistry. He graduated with honors and has received many awards for his expertise in implantology. In addition, he has completed several continuing education courses in dental implants, and has studied at the world-renown Las Vegas Institute. When you come to Dr. Mohanna for a dental implant, he performs the entire process from the placement of the implant to the attachment of the final tooth restoration. And not only will you benefit from Dr. Mohanna’s expertise, Complete Cosmetic Care Dentistry now has the ORTHOPANTOMOGRAPH® OP300 Maxio. This advanced 3D technology gives Dr. Mohanna a dramatically clearer view of your upper and lower jaws, as well as your sinus area. With this clarity, he is better able to plan the accurate placement of your dental implants for greater stability. With the plan in place, Dr. Mohanna can begin rebuilding your smile. While you’re comfortably anesthetized (and we offer sedation dentistry if you’d like, too), he will perform oral surgery to precisely place your dental implants in the bone beneath the gum tissue of your missing tooth. These small titanium posts recreate a tooth root. Because they are made of titanium, the posts are completely biocompatible and easily fuse with your jawbone. Actually a beneficial connection develops between the post and your bone; the post is anchored by the bone and the bone is stimulated by the post. This stimulation encourages healthy new bone growth, so you avoid the deterioration that usually happens when a person is missing teeth for a long period of time. Once the healing process is complete and Dr. Mohanna is certain that the implant is secure, you will return to our office in Glenpool where he will complete your tooth replacement treatment. The gum tissue that healed over the implant is carefully removed to reveal the post, and Dr. Mohanna attaches a permanent porcelain crown. This crown is custom-designed to look, feel and function like a natural tooth. After a time, Dr. Mohanna’s patients cannot tell the different between a real tooth and a dental implant with a porcelain crown. 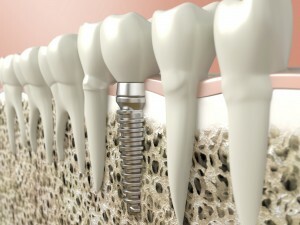 Dr. Mohanna also uses implants for implant-retained dentures. Rather than endure the problems of ordinary dentures—slipping, clicking sounds, and difficulty chewing—you can enjoy the security of dentures that are firmly held in place by implants rather than natural suction or annoying denture adhesives. If you are ready to replace your missing teeth with dental implants, then call Complete Cosmetic Care Dentistry in Glenpool, OK, and schedule a consultation with Dr. Mohanna. Patients come from Tulsa, Bixby, Jenks, Okmulgee, Sapulpa, Keifer and beyond for our outstanding implant dentistry.